There were immigrants from Italy from 1000 onward, and possibly earlier: artists, artisans and musicians from Italy traveled around Europe and further, offering their services to the wealthy, or performing for the public, including in London. In the 1200s and 1300s, bankers, traders, and merchants of all kinds, mainly from the Genoa, Veneto and Lombardy regions, rich trading regions, set up offices in major trading cities and along trade routes, including in London. In the late 1500s, the Venetian Giacomo Verelini was making glass in London. After his death, British businessmen monopolized glass-making in Britain, but imported Venetian glass makers to run the show. This is a link to an article on the Vauxhall Society site about this. In the 1700s and 1800s, Italian artisans/craftsmen emigrated with their skills, to find a more secure life, to the capital cities of Europe, and to the emerging industrial cities of Britain, including London, a growing megalopolis that grew in population from 1 million in 1800, to 6,7 million in 1900. Here is some information on the Italians living in London from the 1700s to 1911 as described in an informative book, in Italian, on Google Books: Arrivi by the Italia Comitato Nazionale Italia nel Mondo. The Italian community in London was based in the area of the north of the city, Clerkenwell, by the mid 1700s. In the beginning, they were mainly artisans making mirrors, frames, mosaics, and scientific instruments like barometers, thermometers, microscopes, telescopes and surgical instruments. Over time, rural immigrants joined the group, although many of these were seasonal immigrants. Other arrivals, later, were republicans fleeing a monarchist Italy, and members of the rare middle class from all over Italy. By the beginning of the 1800s, the Little Italy of Clerkenwell already had a Catholic church, and was the most stable community of foreigners living in London at that time. 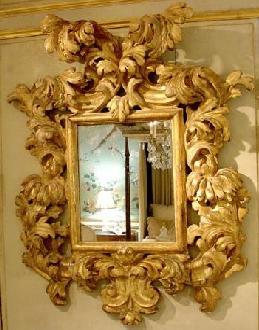 In the 1600s, Italian craftsmen were making mirrors (a looking-glass, uno specchio) such as this. In the years from 1841 to 1881 the residents of the London Italian quarter of Holborn were mainly frame makers, statue makers, ice cream makers, and organists. At the top of the Italian labor pyramid were the artisans made up of makers of optical instruments, silversmiths, makers of frames, bird-cages and fine wood workers. From 1861 to 1911 in Britain, the major part of Italians worked in food service jobs, restaurants, as cooks and waiters. The numbers grew rapidly from 1891 to 1911 going from less than 1000 to more than 4000 people. The second largest group were the grocery shop workers, followed closely by domestic workers (maids, grooms, etc.). Other categories were street-vendors, ice cream sellers, roast meat sellers, and organists. London was home to immigrants by the name of Martinelli. They were not part of the huge wave of immigrants that spread out from Italy during the late 1800s to early 1900s. They probably left Italy around 1800, from the Lake Como area. One of the earliest Martinelli immigrants to London was part of the artisan/craftsmen community (wood workers, metal workers, instrument makers, mirror and frame makers) who found it easiest to emigrate from the Italian peninsula to various European capitals. They took their valuable skills and left for a more secure life abroad. Today we would call it a 'brain-drain', or a 'skills-drain', I suppose. 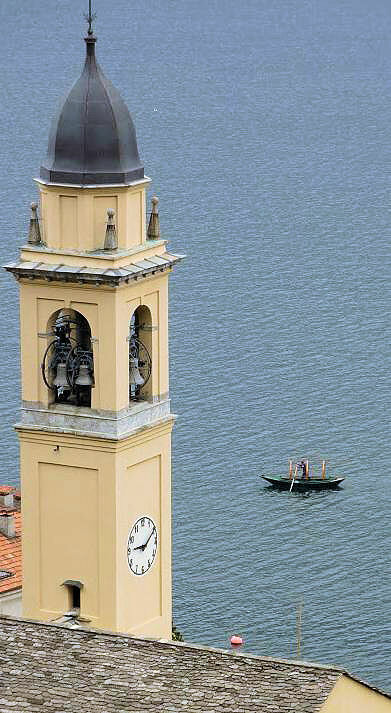 From regions around Lake Como, immigrants went to German cities, the Veneto, and to Torino. These immigrants were those who had the most common skills of immigrants at that time: sellers of barometers and thermometers, metal workers and many builders and craftsmen. Louis (or Luigi) Martinelli, born probably circa 1766, in or near Como, Italy, was likely one of those Lake Como barometer, thermometer, mirror and frame makers. He worked in London in the first half of the 1800s and died in 1845, in London. He and his family carried on the barometer crafting trade for nearly 100 years in London, under various names, and at various addresses. Barometers measure air-pressure, which can then be used to predict the weather. They can also be used to determine altitude: the height of the mercury in it's tube in the barometer corresponds to a table showing the feet above sea level. Barometers were the must-have, high-tech item of their day, first in the homes of the wealthy, at at shipping and fishing ports, and then in the homes of the growing middle class. From the mid 1800s to 1900, mercury barometers reigned, but then the aneroid barometer made it possible to produce smaller barometers, more cheaply, eventually destroying the market for expensive handcrafted mercury barometers. At it's height, the barometer was combined in a beautifully tooled wooden case with various other instruments like a clock, a spirit level, a mirror, a thermometer, and a hygrometer, which measures relative humidity. The early instrument makers called themselves 'makers of philosophical instruments'. 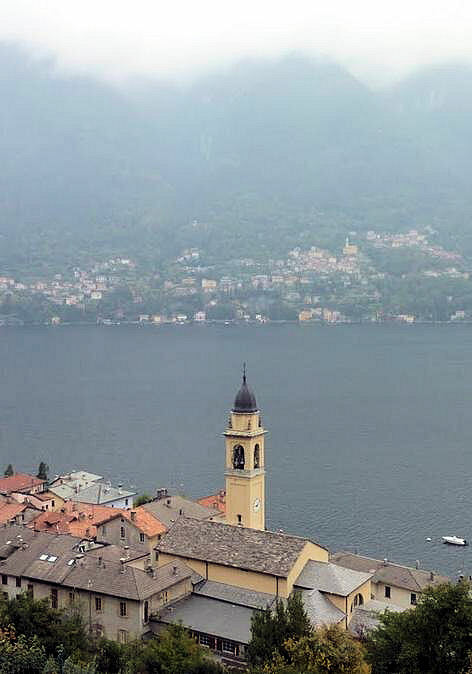 The Italian White Pages show that Martinellis still live in the Lake Como area, but because of Italy's massive internal migration, Martinellis live everywhere in Italy, from Lake Como to Sicily! So it is not definite that all the Martinellis making barometers in London were related. There are many Martinellis who made barometers in London over the years. Some may have been itinerant, coming to Britain, then returning to Italy for a while, before returning again to London. This was a common pattern, it seems, for many immigrants. I am not going to trace all of them, but I will use some of Lewis Martinelli's London family history, all accessible from public records, to help illuminate the life of Anglo-Italians in London from roughly 1800 to 1900. 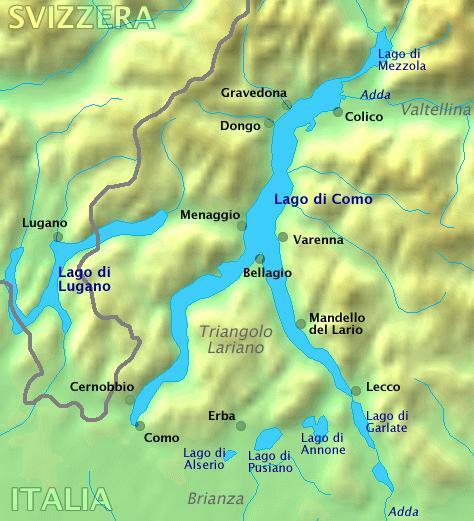 Lewis Martinelli was born in or near Como, Lombardy, Italy, in 1766. Because he was a barometer maker, some of his movements can be traced from the signatures on his barometers. Lewis Martinelli made wheel barometers and thermometers, and was also a carver, gilder and print seller at 82 Leather Lane, London from 1803 to 1811. Leather Lane was at the center of London's Italian community since the 1700s, and would remain so until World War I. Leather Lane links the main roads of High Holborn and Clerkenwell Road. Clerkenwell is London's original Little Italy, beginning around 1700, and later Holborn became known for the large number of Italians and Anglo-Italians living there. Leather Lane, today, is known for the Leather Lane outdoor market where the stalls line the street. (There is a very short promo for the market on YouTube.) The market has been a fixture of the area since as long as anyone can remember, 300 years, say the London historians. Leather Lane is a very old London street, mentioned in a 1538 survey of London. In the early 1700s, a large brewery covered the end of Leather Lane. By the end of the 1700s and the early part of the 1800s, there were several clockmakers on the street. And there was a renowned coach maker, William Fenton, at 36 Leather Lane during this same period. But there were also churches, printers, inns, pubs... all sorts of businesses on the street over the years. And there were other Anglo-Italian barometer and instrument makers in Leather Lane, including one half of the most famous instrument maker that still exists today, Negretti & Zambra, which I mention, again, below. Leather Lane ends at High Holborn, which was another street known for its barometer makers, and the site of Negretti & Zambra's most famous shop. 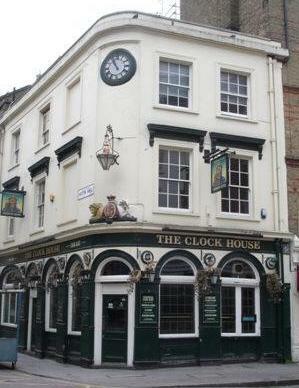 Today, at 82 Leather Lane, Lewis Martinelli's old shop address, is The Clock House Pub. It was probably constructed in 1869 by a Mr. Thomas Middlemore Marshall. From the photo below, you can see that Lewis Martinelli had a wonderful location, situated on a corner of the busy street. 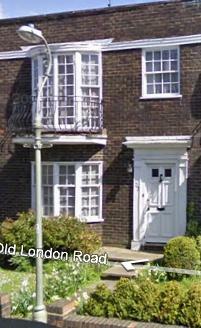 But the address of 82 Leather Lane is interesting because it was also the address of other Martinelli barometer makers. The one just before Lewis is M. Martinelli & Co., barometer makers at 82 Leather Lane, Holborn, London c. 1810. Here is one of M. Martinelli's pieces from that time, that contains a thermometer and a barometer. The description is from an sales catalog. 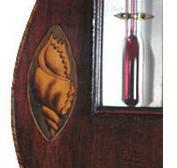 "A mahogany wheel barometer with broken arch pediment above a barometer and thermometer, inscribed 'M. Martinelli & Co., 82 Leather Lane, Holborn, London', the case decorated with inlaid shell and flowerhead motifs c.1810, 39in. high. £180-250." The "inlaid shell" and "flowerhead motif" were just coming into fashion in 1810, and were often called "Sheraton Shell" decoration. Here's a better look at it, and at the "stringing" wood design often found around the edge of the barometer case. Before M. Martinelli & Co, there was Martinelli P. L. M. & Co., a group of Martinelli barometer makers working together in 1799 out of 82 Leather Lane, London. It was traditional in many Italian families, at the time, to name the first born son after the father, and the first born daughter after the mother. Later children were often named after the grand-parents. The P. in the group could well be a P. Martinelli who is known to have worked earlier in Edinburgh, Scotland, and with Ronchetti and Co. in Coventry. Italian instrument makers were known to move around between towns like Aberdeen, Edinburgh, London, Coventry, and on the continent in Amsterdam. Sometimes the spelling of their name changed with each move! Ronchetti, sometimes Ronketti, was another important name among Italian barometer makers, a bit bigger than the Martinelli name, a bit more famous, and working a bit longer at it, into the 1800s. The Ronchetti Bros. worked in London at 172 The Strand until 1880. One Ronketti, John Ronketti, worked in New York around 1850, and another, John George Ronketti, worked in New York around 1852-1853. A major branch of Ronchettis worked out a Manchester, England and developed special instruments for industry. John Merry Ronchetti, sometimes written Ronketti, was the most famous Ronketti barometer maker. He worked as a barometer maker in Italy and then in England, making the earlier-style stick barometers and then, later, the wheel barometers. This is one of John Merry Ronchetti's very beautiful, early English barometers, from around 1787, signed 180 Holborn, London, his place of work for many years. He was from the very first generation of Italian barometer makers in London, who started signing their work, made in Britain, around 1780. Note that the decoration is not the later, standard, shell decor. He also has a compass at the top, and a spirit level at the bottom, with his signature and address engraved on it. 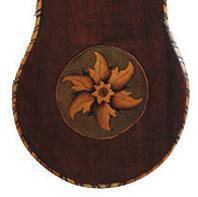 This beautiful flower motif is from another early Italian barometer, made in 1795, by Charles Chivatti. There is also a record of a B. Martinelli making barometers. He could have been part of the Company, too. And D. Martinelli was a barometer maker working on Grays Inn Road, London. 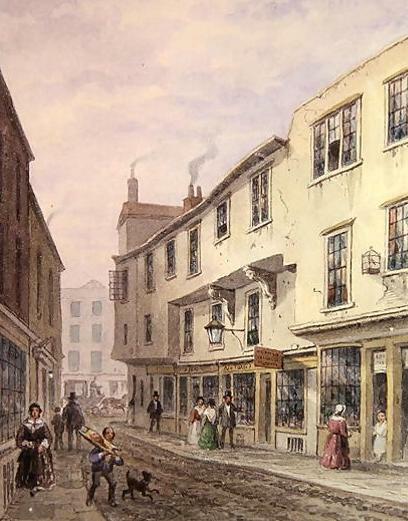 c. 1802, a few streets over from Leather Lane. And later Martinelli & Ronchetti worked out of 34 Grays Inn Road from 1805 to 1825. "Mahogany cased 8" dial mercury wheel barometer and alcohol thermometer by D. Martinelli, 19 Leather Lane, London. 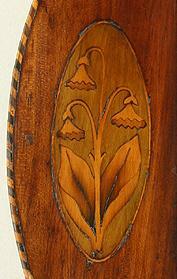 Case decorated with floral and shell inlay. Triple strung boxwood and ebony edge lines. Scale engraved with horizontal weather positions." 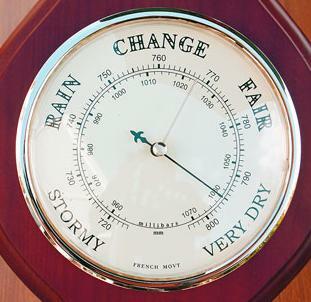 The "horizontal weather positions" refers to the text on the barometer face, such as "Rain", "Stormy", "Fair", etc. Later, they were engraved around the dial face, rather than horizontally. For collectors, this sort of thing is a sign of when the barometer was made. I don't know how long Lewis remained at the 82 Leather Lane address, but some records of barometer signatures suggest he left in 1811, and there is a barometer record that he lived and worked in Brighton, England, at 102 London Road, possibly from 1830 to 1838. The address still exists. It is 102 on what is now called the Old London Road. A bypass road sits to one side of it now, and is the new London Road. The terrace house sits in the middle of a row, and they are not that far from the coast, in a lovely area. Here you can see the road, looking toward Brighton and the sea beyond, with the bubble over the car in the middle, marking the location of the terrace house, on the left side of the street. 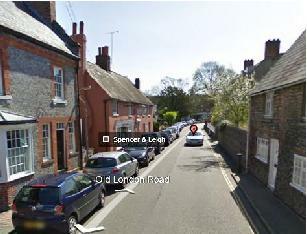 It is a lovely street with shops, charming old houses, pretty gardens here and there, and an old post office. But there is also the record (a census record) that Lewis's son, William Martinelli, was born in Brighton in 1815, so Lewis could well have been living and working there in 1815 when William was born. crime fuelled by a sharp divide between rich and poor, and exacerbated by there being no standing police force for the city (not until 1829). And from 1800 to 1810, the number of Italians emigrating to the Leather Lane area multiplied rapidly. But they were no longer just craftsmen. The Italian poor came in search of work, possessing few skills other than agricultural skills. The character of the area changed rapidly from an artisans' area, to a raucous Little Italy. In 1841, the Italian patriot Mazzini complained that London's Italians spoke a mash of Comasco (the Lake Como dialect) and English, but not a proper Italian. He set up a free school for them, to learn proper Italian, and to encourage their patriotism for a united Italy. He firmly believed that once Italy was united into one country, all of Italy's diaspora would return to live in a prosperous Italy. And Irish immigrants settled in the Clerkenwell area, too, aggravating the already difficult living conditions. They settled there because it was cheap, and because they preferred to live with fellow Catholics for safety from anti-Catholic bigots. In the early years of the 1800s, the only Catholic religious services in London were conducted by Italian priests, in English and Italian, on the embassy land of the Kingdom of Sardenia. In the early 1800s, 20% of London's population was from Ireland. In the 1800s, London grew to become the capital of the western world. Lewis Martinelli, in his 60s moved his family back to London and made thermometers and barometers, and was an optician and looking-glass maker, from 1834 to 1846 at 62 King Street, Borough, London. The Borough is today called Historic Southwark. It is the area of London near the south end of the London Bridge. There is a famous Borough Market that still exists today. At that time, it was quiet usual that several generations of the same family lived together. Social nets provided by the government did not exist, so poverty among the elderly was a real problem, unless they had children to take care of them. The sometimes dire situations of Italians in London prompted better-off Anglo-Italians to form social organizations to provide assistance to the destitute and needy within the Italian community. They even established a school and an Italian hospital in London. During this time, 1835-1845, Lewis's son, William, made barometers under his own name. W. Martinelli worked out of 2 King Street, down the street from his father. Also working out of 2 King Street from 1835-1855 was N. Martinelli. Another brother, perhaps, a relative? "A William IV rosewood wheel barometer with timepiece by Lewis Martinelli, London. Circa 1835. 'The case with swan neck pediment and banded with kingwood within ebony and boxwood stringing, with hygrometer above bayonet-fixed mercury thermometer with bow-front glass, with convex brass bezel and glass to 6 in. diameter silvered Roman dial (the clock), with eight day single chain fusee movement with anchor escapement, blued steel moon hands, convex brass bezel and glass to 12 in. diameter silvered dial engraved to the centre with a terrestrial map, signed L. MARTINELLI & CO./62 King Street/BOROUGH, with spirit level below. 50¼in. (127.5cm.) high. Estimated value 4,000$." On November 11, 1838, Lewis Martinelli's son, William, married in London. William would go on to have a large family, and William's sons would follow him into the business, for a while. After the barometer business declined, the sons found other professions. There is more on William below. I want to mention here another Martinelli family who was making barometers in London at this same time. I don't know if they were relations of Lewis or not, but their story has a unique element in it. 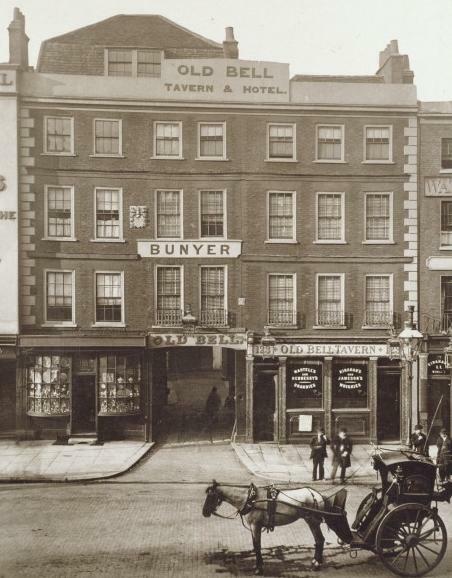 with the William Day & Co in 1850 at 70 Union Street, Borough, London. When Alfred died in 1851, his wife Elizabeth took over the business and made barometers, signed E. Martinelli,18 Vauxhall Street, Lambeth, London, from 1851 to 1853. Their son, Alfred, later joined her in the business, for a while. This barometer was made by an Alfred Martinelli. The text is from a sales catalog. "A MERCURY WHEEL BAROMETER in a mahogany case with satinwood edging. A swan neck pediment with central brass finial. A silvered engraved thermometer scale and main dial. Circa 1830. Signed on the main dial "A Martinelli, Halesworth". Height 37 " / 94 cms. £ 580 (US$ 939) (Euro 638)." Lewis Martinelli's son, William Martinelli, began making his own barometers around 1835, usually labeled W. Martinelli. From 1840 onward, William and his wife's family grew. Census records record the growing family and their addresses, and the professions that William and his family members listed on the census forms. 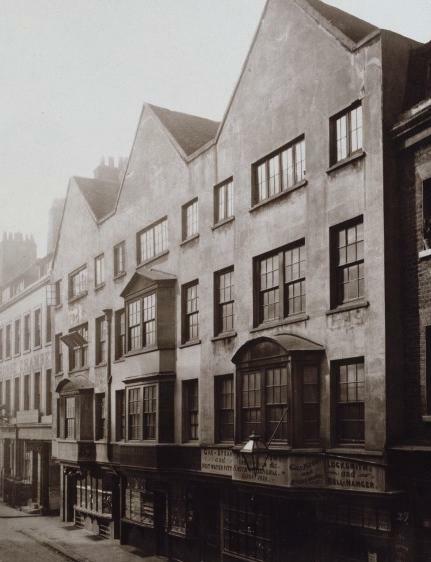 By 1841, William had moved his business to 5 Friars Street, Blackfriars Road, London (1841), not far from his previous address in the Southwark area of London, south of the Thames River. In case you're wondering, the maker's signature was usually placed on the spirit level at the bottom. You can just make it out here: W. Martinelli 2 King Str, Bor. In 1845, Lewis Martinelli passed away, at the age of 79. He lived a long life, saw his grandchildren born, and perhaps even his great-grandchildren. He saw London grow from chaos to the West's major city. And during his lifetime, Lewis Martinelli created works of art that would be prized possessions in countless families over the years, and that still command hefty prices for anyone wanting to own an L. Martinelli barometer. It is also around this time that William started to sign his work: W. Martinelli & Son, 2 King Street, London. Here is one of those barometers. You can see that the woodworking is more sophisticated than the earlier model, but he still has a mirror in place of the clock. The text is from a sales catalog. "A 19th Century mercury wheel barometer and thermometer with broken pediment, dry/damp indicator, thermometer, mirror, silvered dial and spirit level by W Martinelli & Son, 2 King Street £200-300"
"Mahogany five glass banjo clock barometer, signed W. Martinelli & Son, 54, Snows Fields, Boro, the 10" principal silvered dial within a satinwood banded shaped case surmounted by a broken arch swan neck pediment. Estimate: 800-1200"
Soon after that, perhaps even as soon as 1851 when the census was carried out, William signed his work: W. Martinelli & Sons, 54 Snows Fields, Borough, London, again in the Southwark area, and not far from the previous addresses. William and his family appeared in the census of 1851 and were listed as living at 54 Snows Fields, Bermondsey, London. Snows Fields (today Snowsfields), Bermondsey. 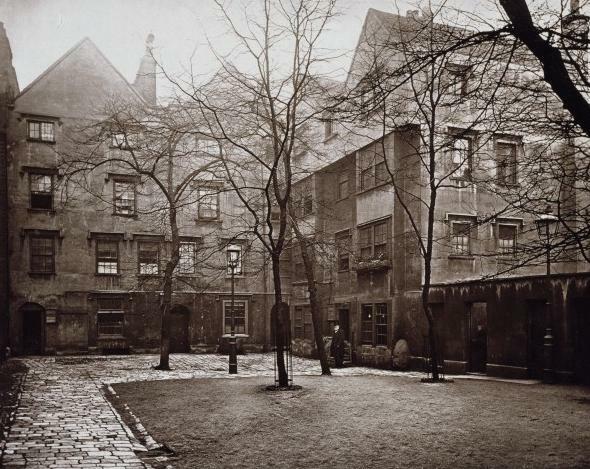 Here is a photographic image from 1881 of houses in Bermondsey Street, just off Snowsfield. These were some of the old houses from Elizabeth I's era that were demolished in Bermondsey to build new, better housing for London's growing population. This is 48 Snowsfields today, the first address on the left. It is the sort of building William would have lived in, above, and had a workshop, below. This stretch of William's era's housing is the only stretch that still exists in this recently renovated area. I don't think this part will last long. Something the 1851 census shows clearly, is that large families were the norm at this time. Reliable birth control did not exist, even if families wanted to use it. And the toll on women of near continual pregnancies was very high in terms of poor health and early death. When retracting family trees through this period, many find that quite a few men married more than once, upon the death of their wife. Families were, contrary to popular opinion, quite often composed of a father, step-mother, and the children from more than one mother. And the streets of London were teeming with children, just as the streets of many developing countries today are teeming with children, for similar reasons. But childhood deaths were common too, during this time of smallpox, influenzas, measles, infections and poor sanitary conditions. The death of a child was a terrible curse on all families at this time, rich and poor. Here is another very beautiful William Martinelli barometer. The text is from a sales catalog. "Mid-19th Century, in a boxwood and ebony strung mahogany case with flame veneer, and with five dials for the various instruments and a spirit thermometer and butler's mirror. 38" high, 10" wide, 2" deep." The estimated price is 1500.US$"
Later, William Martinelli signed his work: W. Martinelli, Snows Fields, Bermondsey, or W. Martinelli, or 120 Snows Fields, Bermondsey, London. This was likely because he moved, and was working alone again. By the time the 1861 census came around, William was 45 and still listed as a barometer maker and living with his wife and their children. The children had found professions of their own, such as Tinman (a metalworker who made, sold and repaired tin pots and pans), and a Laborer. London was booming by now. Public works were everywhere to be seen. Making the city livable for the millions already there, and for the projected millions due to arrive in the coming decades, was a major priority of the borough and city governments. The public works created jobs, not just temporary jobs. Young men could find work driving trains and trams, installing and maintaining gas lighting, building and maintaining paved streets and sidewalks, and policing the city. And then there were the jobs in the service industries that helped provide food and for the other needs of London's millions. Barometer making was no longer a viable profession. So when the 1871 census came along, when William and his wife were 55, William described himself as an optician (the census forms were filled in by the head of the household). William's death was recorded in March of 1891, aged 75. William lived and worked in London all his long life. His mother and his wife were not likely Italian immigrants. Perhaps, what little of Italy's culture that remained with William by the end of his life, were his barometer making skills, and his last name. To get an idea of what London was like about this time (1905), go below to view a film from the era. It is fascinating! Many Anglo-Italians left Britain during the period from 1900 to the post-WWII years. World Wars, internments and the loss of empire for Britain, pushed many to make the leap and move to Australia, Canada or New Zealand, for example, for a fresh start. Some had no choice. Britain transported many Anglo-Italians, those without citizenship, abroad. Part of the fresh start for some immigrants was a name change. For some that was to avoid anti-Italian bigotry in their new home country. Some had changed their names earlier than that, for the same reason. For others, it was just part of the fresh start they wanted. Little did they know that their descendents would ask 'Where did I come from?' and try to retrace how they came to be where they were. And if they found they were of Italian descent, they would try to identify the first in their family to leave Italy, and to know why they left, and if there were still relatives in Italy. Many descendents of those early Italian immigrants try to rediscover their Italian heritage by traveling to Italy, studying Italian and Italian history and culture, and by cooking Italian food. As you can guess, I applaud their efforts! I am an Italophile. Throughout this period, there were Anglo-Italian barometer makers working in Glasgow, Edinburg, Manchester, Bristol, Bath and other towns. The woodworking skills were similar to the skills needed to make musical instruments. The skills needed to make the finely crafted instruments set into the wood casings, were useful in making optical and surgical instruments. Barometer makers often made other scientific instruments, and were opticians, too. "Wheel barometers (sometimes called banjo barometers) were used throughout the 18th century but they did not become popular until C.1780. They were then made mostly in London by Italian Craftsmen. The wheel barometers at this period featured crossbanded sides, high quality veneers and engraving and very finely made cast brass bezels. As the 19th century approached the volume of wheel barometers increased and an almost standard form was being produced which is sometimes called a Shell Barometer. This was made until C.1830 when other features such as Mirrors and Hygrometers became more popular and the 5 Dial Barometer was introduced. Towards the end of the 19th century when the Aneroid Barometer was found to be easier to transport and cheaper to make, the Mercurial Wheel barometers eventually came to an end." Edwin Banfield is a historian who has specialized in the history of barometer making in England. His books, like Barometer Makers and Retailers from 1660 to 1900 (pub. 2000), and The Italian Influence on English Barometers from 1780 chart the history of skilled Italian immigrants. He says the barometer makers came mainly from the Northern region of Lake Como, Lombardy, Italy. 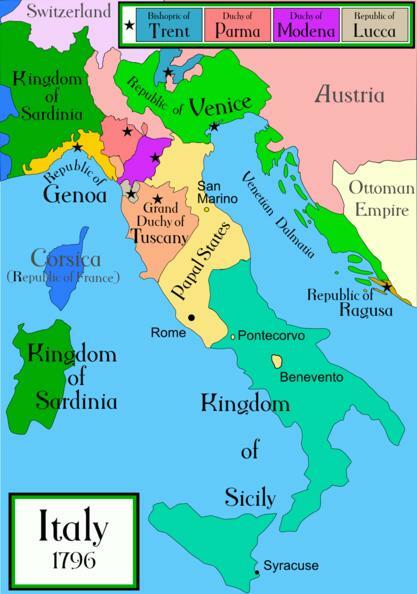 Italy was very poor at the time, and rife with political struggles that would eventually lead to the unification of the peninsula and the birth of the Italian nation. Italy also had a rich history in scientific achievement and a large pool of skilled artisans. Italian barometers were of a more practical and beautiful design for sale to wealthy individuals. And they were housed in a beautiful wooden cases reminiscent of musical instruments, together with other goodies such as a spirit level, a thermometer, and later with a clock, a mirror, and a hygrometer. Those artisans chose to leave Italy, sometimes for only a part of the year, others for good, but often sending money home to the relatives left behind. Some sent for the relatives to join them in businesses they established abroad. The area around Lake Como is very difficult terrain to cultivate, and most Italians at the time relied on what they could produce on their small plots of land, so life was precarious there, and not suited to supporting the large families that were the norm. The barometer makers went to wealthy France, The Netherlands and Britain, mainly. And they immediately made an impact on the local production of barometers. The local artisans were forced to copy the Italian designs, designs the customers craved. Foreign makers hired Italian artisans, some formed partnerships with Italian artisans. 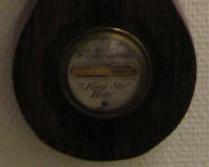 The older model of barometer was the Stick Barometer, which housed the long mercury tube in the casing, and had the prediction panel at the top. The Wheel Barometer, translated the tube's reading, using a pulley system attached to the mercury tube hidden in the back of the Banjo Barometer's case, to translate the mercury movements to a round dial with a clock hand that pointed to the weather prediction. Here is a photo of the back of the a Banjo Barometer case, open to show the tube and pulley system. A Banjo Barometer case included many small pieces, as can be seen here in the image from an English barometer restoration shop. The town of Cantu, just south of Lake Como, has been know for as long as anyone can remember for furniture making. It is still the biggest industry in the town today. This nightstand was made there, about 1930, for a Lake Como villa. 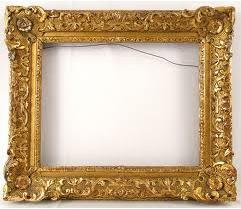 You can clearly see the frame, mirror, carving, and cabinet skills that were used by the early Italian immigrants to London to make mirrors, frames and barometer cases. This is Mr. Banfield's list of barometer makers working in London from roughly 1800 to 1900. You can see that it was dominated by Anglo-Italians. 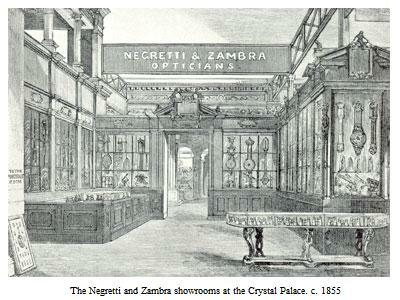 One of the most famous of the Anglo-Italian Optician/Barometer makers was Negretti & Zambra. 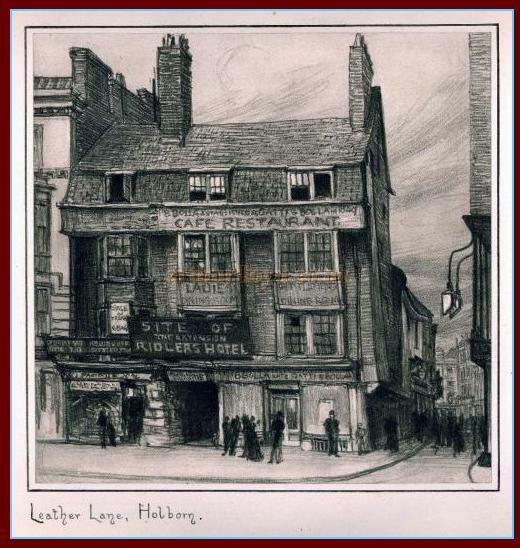 This is a drawing of their London store in Holborn, on the Holborn Viaduct (High Holborn), which crosses Leather Lane. 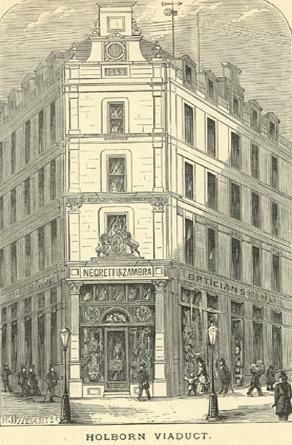 Henry Negretti was from the Lake Como area, too, and in 1843, he set up shop on Leather Lane. In 1850, Mr. Negretti and Mr. Zambra set up shop together, and moved offices several times as their business grew. 1920s to today - aircraft gauges. "It was at this stage that the Italians appeared on the scene in England. It had been soon after 1670 that Italian hawkers (travelling sellers), began to sell barometers all over the European mainland. Most of them came from northern Italy, from the district around Lake Como, and they were following in the footsteps of many past generations of their countrymen. 'The mountainous country of northern Italy provided a sparse living for the people, and during the winter months the farmers and shepherds would turn their hands to crafts of all kinds. These skills were handed down from father to son, and the things they made would be carried north over the Alps by many hundreds of the younger generation, to be sold in the more prosperous areas of Europe. These travelling salesmen would spend a few years abroad and then return home, to settle down with their families and in turn pass on the trading to their sons. 'They were quick-witted, intelligent people, and they learned fast. Once Torricelli's experiment had evolved into the barometer they began adding it to the religious images, laces, silks, thermometers, musical instruments and telescopes that were already their stock in trade. 'The Italians did not come to England to sell barometers until the later 1700s and early 1800s. There had always been Italian acrobats, artists and musicians in England, but they had been few. There were several reasons for the tide that began to flow in the last years of the 1700s. 'Prior to the French revolution, the markets they could reach over land, or down the great rivers, would give them plenty of trade. After the revolution, and the subsequent ravaging of the Continent by Napoleon, things were very different. They would naturally look towards the one major country that had not been over-run by the French: England. 'Although it had escaped invasion, England had been fighting Napoleon for nearly twenty years, and by the time he was finally defeated at Waterloo, England's wealth had been drained away, and she was bankrupt. Unlike the Continental countries that had been invaded, however, England had retained her stability and her national institutions. 'Furthermore, the countries of the New World were clamoring for the products of her industrial revolution, so that her recovery was comparatively swift. As prosperity grew, the rise of the wealthy middle classes brought an enormous demand for consumer goods of all kinds, and the enterprising Italians took advantage of that rising demand. 'Soon after 1790, their markets in France closed to them by the revolution, the Italians began to come to England. Looking-glass makers, picture framers, bird cage makers, ice cream makers and sellers, and thermometer, telescope and barometer makers arrived in a growing tide. There were also, of course, large numbers of relatively unskilled people who followed their traditional occupation of hawking their countrymen's wares around the countryside. 'The early arrivals made for London and settled in the Clerkenwell area, perhaps because its narrow streets and little enclosed courts reminded them of home. Those who prospered would send home for relatives to join them, and soon the place became so full of Italians that it was known as "Little Italy". 'They kept very much to their old ways, holding religious processions on the saints' days, and turning out for church in their traditional dress. In 1863 a new, Italian style church was opened in Clerkenwell by Cardinal Wiseman. In a later newspaper article, Geoffrey Fletcher described it as " a slice of unadulterated Italy dropped into workaday Clerkenwell". The church escaped the bombing of the Second World War, which devastated much of the area. 'Although "Little Italy" became the centre for Italians in England, there were not by any means confined to the capital. By the middle of the 1800s there was hardly a town in England or Scotland of any size that did not have at least one Italian barometer maker, plus of course others in different trades. 'The early settlers pursued their callings with varied success. The mosaic floors of Victorian pubs and public lavatories were mostly laid by Italian immigrants. The hawkers quartered the countryside, selling their multifarious wares. Ice-cream sellers pushed their brightly painted barrows through the streets, crying "ecco, un poco" or "here, a little". 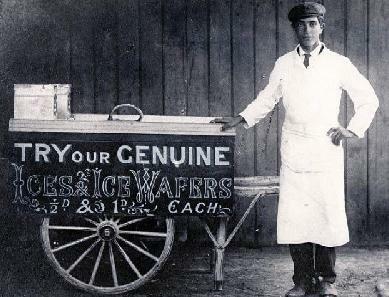 'The Gatti family established the famous West End restaurant and made ice-cream respectable and fashionable. Barometer makers like Negretti and Zambra, Ronchetti, Casella, Tagliabue and Corti, to name but a few, set up and devloped their businesses. 'The barometer makers formed a close community and kept in touch with their less fortunate countrymen. The smaller firms would buy tubes and other parts from those with more extensive workshops, and assemble them into cases marked with their own names. 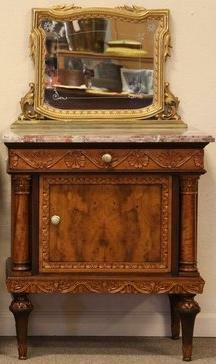 The cases were often made at home by Italian wood-carvers, or in the case of English makers, by local cabinet makers. They would be paid a few shillings each for the cases, which would be finished off in the workshops of the bigger firms. 'This practice became virtually universal, and it is very difficult to know whether the name on a barometer is that of the maker, or even if any single maker was involved. Even well-known makers bought fin from each other. For example, Negretti and Zambra regularly supplied sixteen other makers in London alone, and an even longer list throughout the country. Research shows that barometers with the names of country makers on them were usually bought in from the Italians in London, and then sold with the retailer's name on the case. An example of this comes form the Devonshire firm of jewelers and clockmakers, W. J. Cornish of Okehampton." "A nickname applied to the western side of Clerkenwell because of its strong Italian connections, which go back at least two centuries. 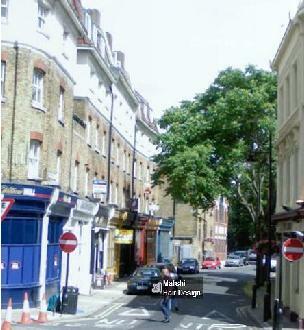 Also once known as Italian Hill, its boundaries are recognised as Clerkenwell Road, Farringdon Road and Rosebery Avenue. As well as the Italian church of St Peter’s, there a few local shops and services run by members of the Italian community, but the number of these premises is declining. The greatest concentration of Italians in the area was around the end of the nineteenth century. Before this, the Saffron Hill vicinity had been notorious for the pickpockets and fences portrayed in Oliver Twist and the authorities were glad to see these supplanted by the more respectable Italians. London’s Italian population is now spread more thinly throughout the capital, but Sunday worship at St Peter’s still provides a focal point. 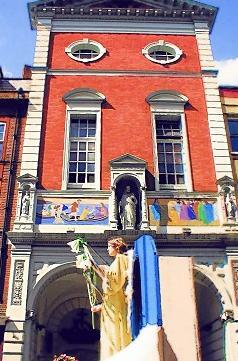 The Processione della Madonna del Carmine, held on the Sunday after July 16th, is Little Italy’s most important event. Except during wartime it has taken place every year since 1896. Giuseppe Mazzini, the writer, patriot and revolutionary, lived in Laystall Street and founded an Italian language school in nearby Hatton Garden in 1841." A wonderful article, as a PDF, about the founding of the Italian church, with plenty of fascinating information about London at that time, and about the Italian community in London. Click here for an account of Italians in London from 1800 to 1960 by reporter Varusca Calabria for Culture 24, in 2006. And for a lovely site with stories and images: De Marco's. 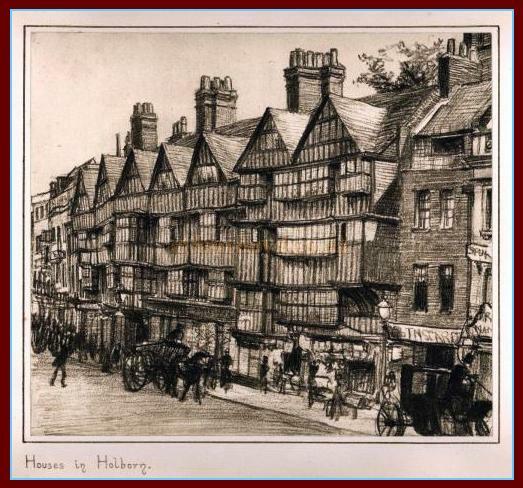 In the late 1800s, the artist Frank Lewis Emanuel (1865-1949) tried to document parts of London that were slated for demolition, or were in threat of fast disappearing. London's middle-age and Renaissance buildings are nearly all gone. Artists over the years tried to document the disappearing city, much as the artist Borbottoni documented Florence, Italy's medieval district before it was demolished. If you wish to know more about what life was like in the 1800s in Britain, visit the Channel 4 History of London site. And check out the 120 photographs of London from 1875 to 1887, made by the Society for Photographing the Relic of Old London. He collected his sketches together in a book called Disappearing London. His illustrations were used for the 1913 book A Londoner's London by Wilfred Whitten. Here are a few of them showing old Holborn and Old Leather Lane, mixed together with photos and other cool images. Leather Lane. 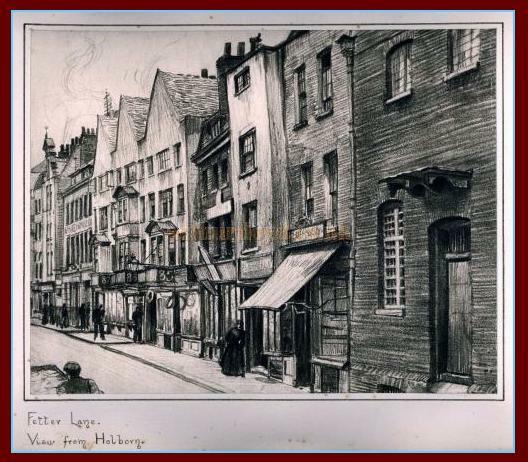 I think we are looking at the entrance to Leather Lane, in the right in the drawing, from High Holborn. This is another view of old Leather Lane looking the other way, from Leather Lane to High Holborn, from a 1857 painting by Thomas Hosmer Shepherd entitled: Old House at the Entrance to Leather Lane. This is a row of Houses in Holborn. 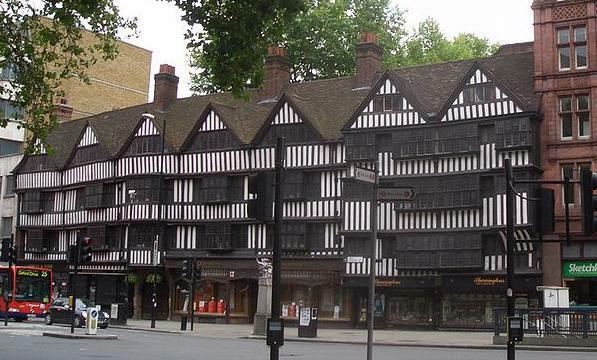 Here is an image from today of this line of houses built in 1586, known as The Staple Inn, and famous as one of Central London's few remaining Tudor buildings. Fetter Lane, as seen from High Holborn. Fetter Lane runs off one side of High Holborn, while Leather Lane runs off the opposite side of High Holborn. They looked very similar in architecture and shop-fronts. The maximum 5-story buildings, often constructed partially with wood, were all torn down and replaced by larger stone and concrete structures that could house more people. Here are photographs showing Barnard Inn, the three-pointed row of houses in the drawing above. The Barnard Inn was an old Courtyard Inn. Stages, people, carriages, etc. could drive into the courtyard and enter the Inn from there. 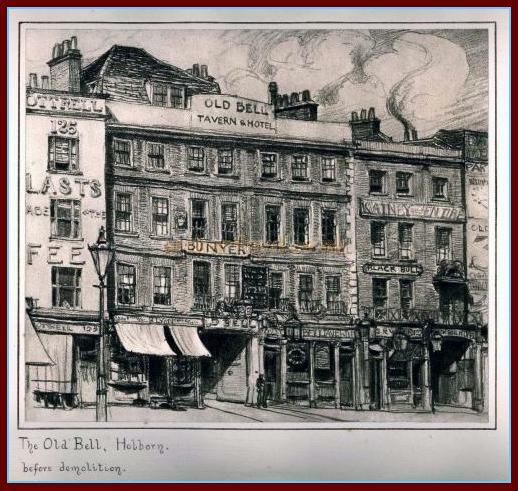 The Old Bell Tavern & Hotel on High Holborn, not long before it was demolished. Here's a photograph of the same building at the same time. Click through to read more about the building. It, too, was a Carriage Inn. In this photo you can clearly see the entrance into the courtyard for the carriages. The Post carriages stopped at the Old Bell, carrying mail and passengers. 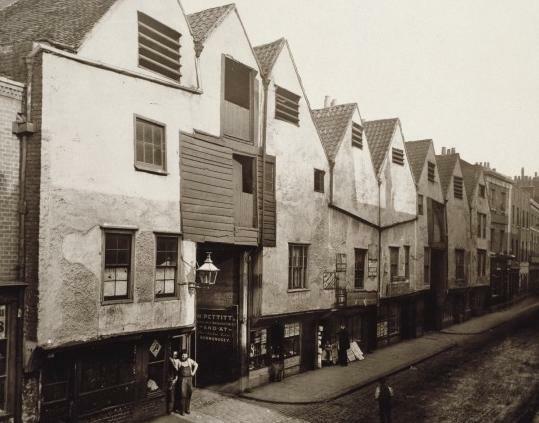 This is an image of old houses on Bermondsey Street in Southwark, houses that were said to date from the time of Elizabeth I. This fascinating film (4 mins) is from London 1905. It shows the streets congested with horse-drawn trams and carriages, pedestrians everywhere in the street, and if you look closely, you'll spot some motorcars, too. It gives a good idea of the chaos of London then (not so different from now!). This film is only 38 seconds long but it is beautiful. It shows the world passing by on Blackfriar's Bridge in 1896. Here are some interesting books on the subjects mentioned on this page, available via Amazon.com (some are VERY pricey, sorry, but they look wonderful. CM). The Italo-Swiss emigrated to London, too. This page from a 75 year old Swiss radio station offers a wonderful description, in Italian, of the immigration of the Ticinesi from roughly 1800 to 1905, when the Alien's Act stopped mass immigration into Britain. They even give details up to 1987, when the last Ticinese restaurant in London closed it's doors. This is a great history site with lots of images of 20th Century London. If your Italian family passed through Britain, and you want to know more about them, there is a wonder site that can help: the Anglo-Italian Family History Society. Among their treasures is this Table of Italian Immigration Patterns in Britain.